The Boxer Uprising better known as the Boxer Rebellion originated in Northern China as a folk movement in reaction to poverty, natural disasters, weakness of the Chinese Imperial government, and negative foreign encroachment. What started with peasants in Shandong province burning foreign churches and killing Chinese Christians would grow and spread in intensity. In time increased violence would come to embroil the Qing government, a multi-national foreign army, and a large fighting force of Chinese peasants known abroad as The Boxers in a conflict that would impact the history of China and its future. It would be a great challenge to briefly summarize so many events here so I have added a related history video below, and the Boxer Rebellion wiki page linked here. I really encourage you to engage both. For my purposes now I just want to share the images from the museum and let the readers use them and the related resources to educate themselves further. Above - left to right: Chinese hook swords (note spike on top), German military saber, numerous antique Chinese firearms, various Chinese edged weapons mixed with several French bayonets on rack, and one random Islamic dagger below the crossed Chinese double sabers in the center of the photograph. 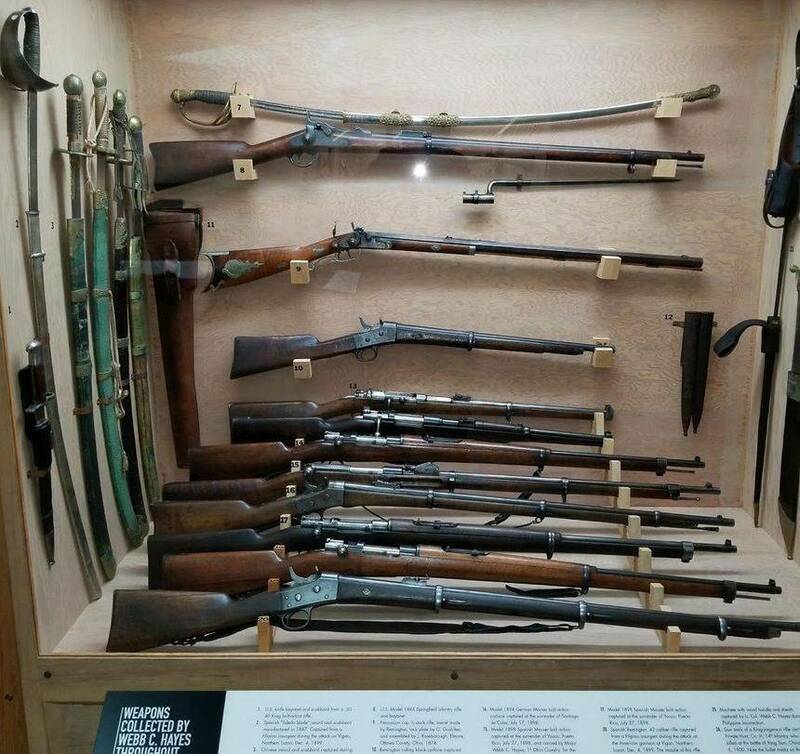 These weapons were collected by a military officer named James Webb Cook Hayes (March 20, 1856 – July 26, 1934), the son of former President Rutherford B. Hayes. 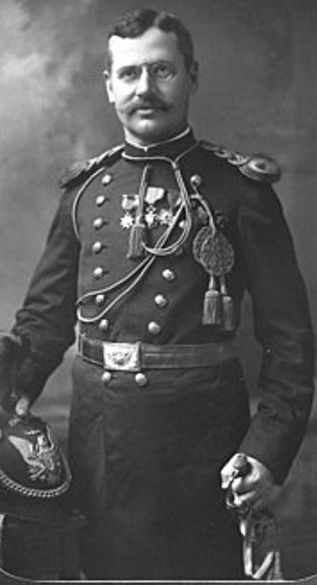 He served in multiple capacities in the Spanish–American War, Philippine–American War, China Relief Expedition (Boxer Rebellion), and First World War. He obviously had a passion for arms collecting because he brought back many weapons from all these chapters of his service. These items are still together and on display today at the Rutherford B. Hayes Presidential Libraries and Museum in Fremont Ohio. Picture - Huge wall defense gun in bottom of cabinet. 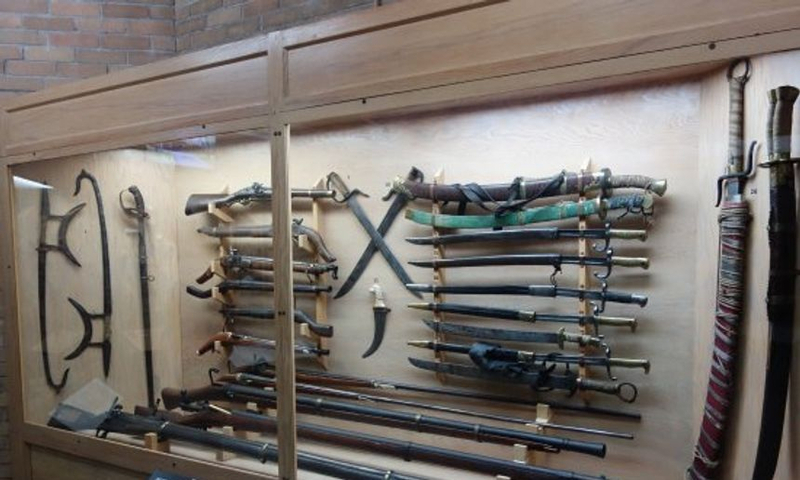 There is a large variety of weapons pictured here and on display at the exhibit. 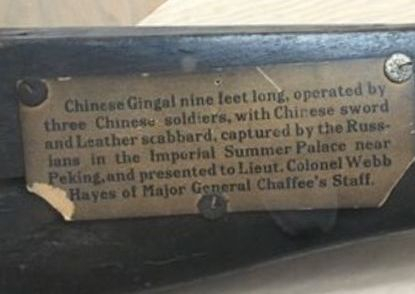 Not only are there Chinese guns and cold arms (l non-firing hand held Chinese weapons), but also items like bayonets and rifles collected from the "Eight Nation" foreign army. 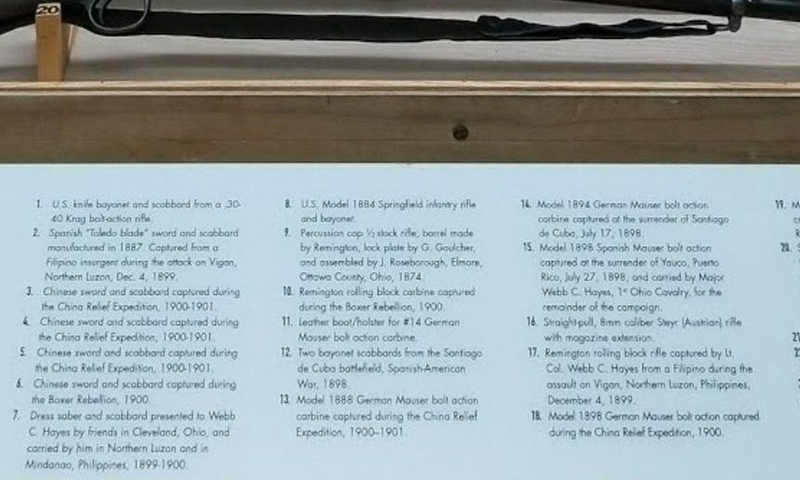 In the bottom two photos below there is a more detailed list to see each individual item described by the museum. I did the best I could to show them with the photos available. Although the firearms are interesting, I am most intrigued by the traditional hand held weapons. For me it is exciting to see this collection as a modern kung fu practitioner because generally speaking so many of this eras traditional arms are the predecessors of our training tools in Chinese martial arts now. In my opinion antique Chinese weapons and their stories are extremely important to study. They can be a valuable resource to help keep today's kung fu knowledge, perspective, and practice rooted in real history rather than fantasy. As I mentioned before we cannot be sure exactly when these weapons were made. We can be reasonably sure though it was no later than 1901, and they were in use during the Boxer Uprising by either Chinese civilian fighters or the Chinese government military. That narrows a logical estimation of their origins considerably. I think it is important to emphasize again that most of these type of antique weapons present themselves with either an unsubstantiated story or more commonly no history at all. We are very fortunate that is not the case here and should take the time to really enjoy and study this collection. Above - Qing Imperial Army officers and soldier sabers/dao on the left.